I suppose this topic will araise sooner or later, so I start it. The wallpaper could be changed to fit OSGeo branding, using the xfce theme "xfce-saltlake" I think the desktop looks good (maybe there are out there better "greenish" xfce themes, I've used one of the installed themes). Screenshot-saltlake-osgeo.png​ (125.2 KB) - added by jsanz 10 years ago. background_light.jpg​ (75.9 KB) - added by hamish 9 years ago. background_dark.jpg​ (155.2 KB) - added by hamish 9 years ago. Ohh, and I've usually add a "System Load Monitor" applet to the xfce desktop, I find it pretty useful to know RAM and CPU usage. Thanks Jorge for starting this. What I'm looking for is a automatic installer script which will install that image. Interested in writing it? I also like the idea of a "System Load Monitor". It will help users realise why the LiveDVD has slowed down when they run out of RAM. Want to write an install_system_load_monitor.sh script? GISVM and OSGeo logos need to be added to the desktop background. I have no idea how to set up xfce wallpapers and applets with scripts (but I can learn :P). Maybe we can upload to the svn the user setings folders (only the xfce folders) and then "svn update" the user folder. This way someone can "design" the desktop (backgrounds, icon placing, applets and so on) and commit the changes to the svn. I've never did this thing. I use Fluxbox, and in ~/.fluxbox/ there are only about 5 files so that's probably manageable. But if there is more than just a few it is probably best to just over-copy or sed-edit the specific ones you want to change. That way it's a lot more robust to version upgrades, and clearer what the edits you made have been. If you bulk copy the directory you'll have to redo the whole thing for each new release, versus (possibly) needing to slightly tweak the script. xfce stores it's data in .config/xfce4 of the user. The files are xml based. .config/xfce4/panel/panels.xml lists the items on the panels, top and the bottom. If you add a file systray-<somerandomidnumber>.rc with the line show_frame=1 and then put and entry in the panles.xml in the <items> section <item name="systemload" id="<somerandomidnumber>"/> It should show up, not sure how to do this programatically yet. 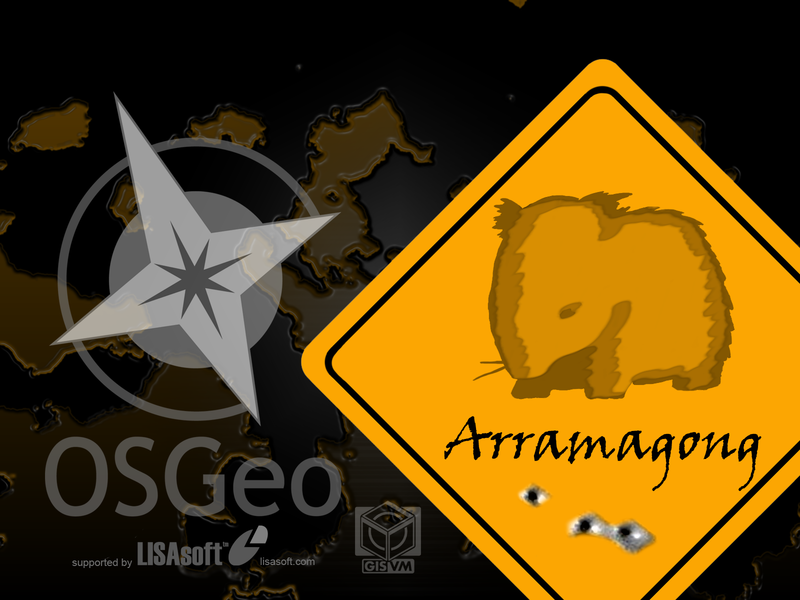 I've uploaded the arramagong wombat image which I'm hoping we can use for the LiveDVD desktop background. This wombat image on a road side is very Australian, and has attracted a lot of positive feedback from the Australian GIS users we have shown it to at conferences. What GISVM artwork is there to include? Is there a startup splash screen/login screen to decorate? re. desktop icons: before it gets too messy, any app that installs >2-3 icons should probably move them into their own folder on the Desktop. Bonus points if you know how to setup thumbnail images on the desktop folders in Xfce to make it easier to find your app. the number of icons on the desktop is making it very cluttered. Lets group them into topic (Desktop GIS, Web Apps, Desktop Apps, ...??) and put them into subfolders off the desktop. So we once again need a new background, the last one was really good looking but we need to shift more towards a generic OSGeo brand. List of Current OSGeo Sponsors, could be a copy of ​http://www.osgeo.org/content/sponsorship/sponsors.html with logos etc pulled from the marketing part of the svn. ​http://www.osgeo.org/files/sponsors/ jpg and gif images, can someone write a bash script to grab the images from there. ​http://www.osgeo.org/content/sponsorship/sponsors.html with logos etc pulled from the marketing part of the svn. I'd like to hear the thoughts & advice of the OSGeo marketing committee before moving on that. That was based on the thoughts of the marketing committee (Cameron and I are both on it). The feedback from FOSS4G is that sponsors wanted to make sure they got credit in some way on the Live project since it comes out of OSGeo. This seems like an easy way to take care of it. It also becomes a deliverable for the marketing team - ie sponsor us and your name will be on our live disc we hand out. The OSGeo actually has marketing material (​http://wiki.osgeo.org/wiki/Marketing_Material_Samples) I would attach the background image but it is too big for a Track attachement; have a look and let me know if I should commit into svn. but we would need the raw gimp.xcf (or inkscape, or whatever) image source from Tyler so we could edit the text and resize to 1024x768 cleanly. I agree that we should make use of OSGeo marketing, and credit OSGeo, OSGeo Sponsors, and LiveDVD contributors in a HTML web page. Extending the idea of OSGeo marketing, I think we should re-theme the LiveDVD with a new background for each major release. (Following the convention of other linux and windows distributions.) It means that people can visually see that there has been an upgrade and it gives users a nice warm fuzzy feeling of "ooh, something has changed, I wonder what else has changed, lets have a look". I also suggest that our project has very strong ties with OSGeo, and hence should brand ourselves as such, but we should also acknowledge our own brand as a project as well. So we should include "Arramagong" in the message too. LISAsoft has a very good graphic artist (who did the last image). I suggest that we give him our suggestions and then get him to put something together. Committed osgeo background into svn; this is the same one used as the marketing materials (and soon website). added 4 alternate backgrounds all based on the osgeo marketing materials. Including a revised version of the current one where I toned done the color saturation so it isn't too bright for background use. Anyone like any particular one, we can add an OSGeo logo to any of them easily. desktop icons are now more sane. It will need more work, I just made my best guesses as to where things should go. I definitely think we should do a menu as well. See the 2.0 disc and install_qgis.sh for the existing Applications->Science->Geoscience menu. I think we should clone from there, not move from there. we should provide a vanilla osgeo clean slate, it should be up to conference organizers to provide their own (completed) background file with whatever conference logo, name/date/place, sponsors, etc they want, if they want. we should keep the help icon on the main desktop & IMO keep it as the wombat roadsign. it works; the sign icon says "look here". the green planet one reminds me of brain surgery. It's hard to put my finger on it, but the symmetry and glowing green are probably partly to blame. the download page needs to go back to being titles as OSGeo Live DVD Downloads; Arramagong is a specific name of one release we make/made and that site hosts; not the name of the live-demo project in whole, osgeo-edu's work, etc. background_light.jpg and _dark.jpg made it, but the base GIMP project is too big. Yes that's where I was heading, couldn't remember how to adjust the transparency in GIMP though. My biggest gripe with the base image used for that is actually that the OSGeo logo is in the worst position for a desktop, any icons will start to cover it. The logo really needs to be on the right side top or bottom. Also note, all the background images I uploaded are directly from marketing material OSGeo paid someone to make. I just cropped them out of the 2 sided brochure and fully expect to add the standard green logo in the corner of each. I think this give us a good 3-4 backgrounds which should last us a few years is every other versions background comes from a FOSS4G. I also agree the Help icon should stay on the desktop and be in the menu. Yes that's where I was heading, couldn't remember how to adjust the transparency in GIMP though. I'm no expert, but my method which seems to work is to add a new blank layer over the top and then adjust opacity in the layer manager dialog. You can change the "Mode" pulldown in the layer manager for different effects. My biggest gripe with the base image used for that is actually that the OSGeo logo is in the worst position for a desktop, any icons will start to cover it. The logo really needs to be on the right side top or bottom. Also note, all the background images I uploaded are directly from marketing material OSGeo paid someone to make. I just cropped them out of the 2 sided brochure and fully expect to add the standard green logo in the corner of each. FWIW I loaded the OSGeoLogo.eps from marketing/logo/ svn into Inkscape and bulk adjusted the hue away from the 'vivid' shade of green before loading the eps @ 600dpi into GIMP, select by color the white background part of the image, select invert, then cut & pasted into a new blank image with a transparent background, before scaling it (bicubic) down to ~ 17-20% size, selecting all, and adding it as a new layer over the background. Probably that method's way more complicated than it needs to be, but it works. Also GIMP lets you worked with the .xcf.bz2 version directly, which is a nice touch. New background, menus and updated sponsor information complete in 3.0. 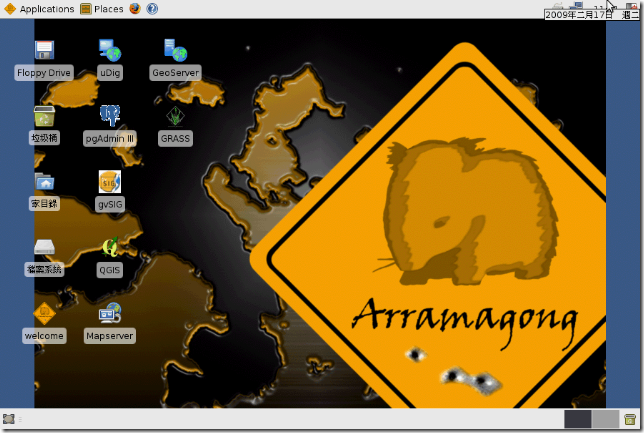 Bumping version to 4.0 where we will finish migrating from Arramagong name to OSGeo-Live. this can be open to endless refinement, but that doesn't need a rolling ticket to happen so calling this one done.